Gansu lies in the crossroads between the countries of Tibet, Mongolia, and Mainland China’s Muslim provinces. You will find more spiritualism than commercialism there. Like many young Chinese citizens, Ga Gui left home in search of greener economic pastures in the city. 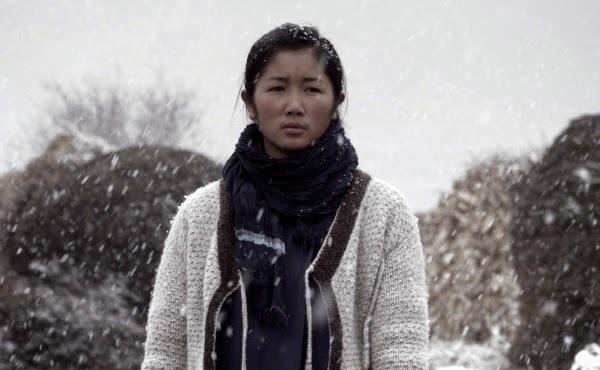 However, a premonition of her father’s death brings her home in Chai Chunya’s hallucinatory Four Ways to Die in My Hometown (trailer here), which screens as part of Cinema on the Edge, a retrospective tribute to the Beijing Independent Film Festival now playing in New York at Anthology Film Archives. Despite Ga Gui’s sudden sense of urgency, her father has been dying for years—and he certainly has not been graceful about it. Increasingly senile, the old man raves against the world from the apparent comfort of his coffin, which he has not left for seven years. Understandably, her little sister is delighted to see Ga Gui, especially since she has just had her own encounter with some sort of holy fool in the mountains. Although she lives in the city, Ga Gui is highly attuned to nature and animals. She can whisper sense into the family’s errant camel, but her powers are earthly in nature. Seeing the spirit world is the purview of others, who have much around them to see. This village is profoundly haunted, by ghosts of both the supernatural and metaphorical kind. Two old puppeteers are determined to exercise some of the latter through a performance, but their third colleague refuses to participate, perhaps because they were never very good at their craft. They started performing during the Cultural Revolution, after the fevered state had rounded up all the great masters. Hometown is inspired by the four Tibetan elements, but Chai is not exactly slavish about underscoring the given themes in each part of his tetraptych. In fact, the narrative is definitely rather loose, safely fitting under the experimental rubric. Instead of delving into melodrama or teachable moments, Hometown serves as the ghost at the banquet—the gibbering reminder of all the dark secrets China has chained up in its rural attics. Sometimes it really makes no sense, but it is always primal. Fortunately, Chai has a painter’s eye for visual composition, because he does not give the audience much else to latch onto. Granted, the soundtrack is truly hypnotic, but the trance-like state it helps induce is almost counter-productive. This is a deliberately disorienting film that is in no hurry to reveal its deeper meanings. Yet, there are moments here and there that resonate with clarity. Chai’s casting instincts are also rock solid, starting with the earthy yet otherworldly Ga Gui. The sprits are angry in Hometown, but fortunately they are also tired. They too are not immune from the film’s lulling effect. Nevertheless, Hometown is densely packed with folkloric references. Indeed, it is the sort of film that cries out for thesis treatment, but there is still no getting around the laborious pacing. 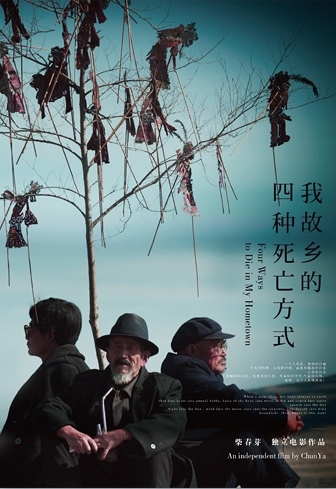 Recommended for experienced patrons of avant-garde cinema only, Four Ways to Die in My Hometown screens tomorrow (7/8) and Wednesday (7/12) as part of Cinema on the Edge at Anthology Film Archives.